Is it possible that Portnoy's Complaint will some day be remembered only as the book that made Philip Roth famous enough to afford to write great, quiet novellas later on? Perhaps--because The Professor of Desire (1977) was the best Roth in years, and The Ghost Writer is even shorter and even better. The theme, beautifully twisting through three twirled narrative threads, is the artist's conflict between the obsessive demands of his calling and the separate but equal demands of family, of human contact. Famous New England/Jewish writer E. I. Lonoff, for instance, has surrendered wholeheartedly to the obsession; he's lordly, wise, funny, and noble (he quietly declined a National Book Award)--but he's been driving his well-bred wife crazy with decade after decade of gentle, helpless, selfish inhumanities. And our narrator, just-beginning writer Nathan Zuckerman, comes upon the Lonoffs at their most genteel-ly violent: he has been invited to dinner to meet and commune with his idol at the isolated Lonoff home in the Berkshires, and his visit (plus Lonoff's attentions toward Amy, a bright, lovely, and apparently disturbed co-ed who's in residence to catalogue Lonoff's work) sets off flurries of domestic anguish. But Nathan also has his own human/literary bind to brood upon, and he does so while staying overnight at the Lonoffs': he has written a true-to-life story--about family bickering over an inheritance--that is an embarrassment, a torture to his New Jersey-Jewish (but distinctly uncaricatured) father; the ensuing father/son dialogue (while standing on the street waiting for a bus) is as nakedly painful as anything Roth has written, quickly followed by Roth at his angry/funniest--as a pompous Jewish community leader joins the fray over the story with "Ten Questions for Nathan Zuckerman." And there's one more variation on the writer/family theme: during that same night Nathan concocts a fantasy about mysterious Amy--she is (or believes herself to be) the Anne Frank, longing to reveal herself to her grieving father but hesitating because a living Anne would rob her diary of its literary impact. 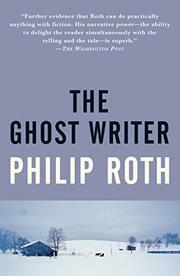 Roth underlines none of this elegant theme-weaving, letting it all emerge through dazzling dialogue and his most understated, almost folktale-like prose. (Nathan describes another, flashier famous writer he has met--"He was like California itself--to get there you had to take a plane.") Elegantly floating and at the same time firmly grounded to home and heart--a sonata-like masterwork.